I would like to thank you, the faithful readers of Teton Tenkara, by giving one of you some flies for Christmas. I have picked six patterns for a giveaway; five of the patterns are my confidence patterns, and one is a new pattern to me this past year that has done really well. 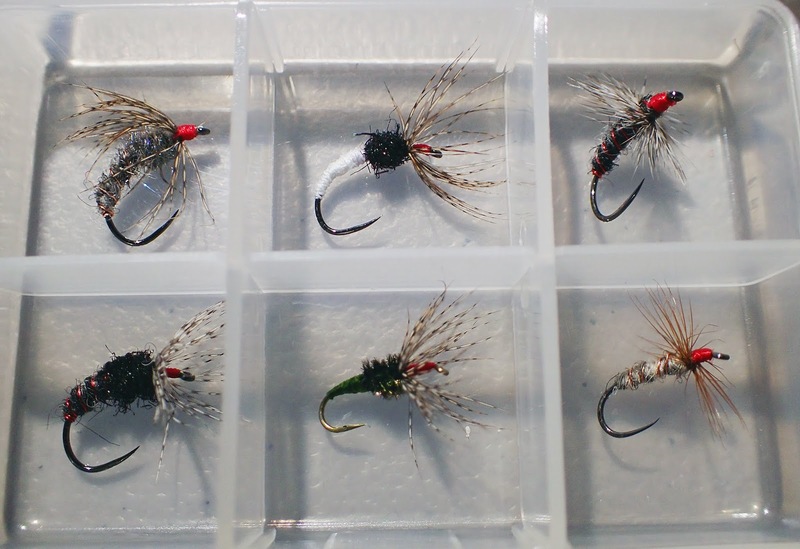 All of these flies are directly out of my summer/autumn fly box, are newly tied and ready to get wet. They are not meant to be displays, but are meant to be fished! I hope they work as well for you as they consistently do for me! #10 Oxford wool sakasa kebari takes another rainbow! If there are caddis on the water, I will use the soft hackle grey. If the water is low and clear, I usually use the Takayama. For my general searching pattern I usually go with the Oxford wool sakasa kebari. When I'm in the mood to do some fly manipulation I go with one of the futsuu kebari. The Tenryu kebari is a new fly to me, but with what little time I have used it this autumn it has produced really well for me. How are you entered to win? Just leave a comment about the blog in the comments section. On Friday, December 14th I will print the comments out, cut them up into individual strips, and place them in a large bowl. My wife will then randomly pick from the bowl the winning comment. I will publish the winner that day on Teton Tenkara. Thank you for your faithful following of Teton Tenkara and good luck! I fish, therefore I am, I think. Tom, love your blog and I sure could use some flies. Maybe your skill will rub off on me. Tom you blog in my opinion is one of the best out there, I’m fascinated by the way you fish and have adopted a lot of your ways. Thanks for the information. Take care. This blog is awesome and I look forward to more (and some flies)! One of the best resources available for new or experienced tenkara fishers alike. Thanks for the info and the chance to win. Very nice! I might have to imitate some of these myself, but these are masterpieces. I’d love to present them to some wild Missouri rainbows! Tom, your blog is definetly in the top 5 sources in the tenkara community. Well done, keep it up the good work. Fingers crossed, those look great! Happy Holidays! Love your blog Tom! I would love to be able to fish with again sometime. Boy I would love to take those to the Oregon Tenkara Bug Out next summer. Tom, whether you give me flies or don't give me flies I feel amiss that prior to this effort I've never told that I appreciate your work - Thank you. Very happy to have found this BLOG. A lot of great posts and information. Thank you. The videos get me through the long Maine winters! Your blog gives me inspiration. Alrighty, Tom. I’m in! Happy holidays! Tom,always enjoy reading your blog and consider it a valuable tenkara resource. Merry Christmas! Thanks for doing this giveaway and posting your confidence flies and when/why you use them. I am always looking for patterns to tie and try. The Tenkara community appreciates you. Winning these would make this holiday a special celebration. Happy Fishing for All! Beautiful flies.I have been trying flies for over 40 years. I am new to Tenkara and enjoy the simple beauty of the flies. Beautiful flies! I'd love to try those patterns where I fish. Thanks for writing the blog and for creating all those wonderful videos. We really enjoy them. Том,отличный блок,спасибо за информацию.Шанс выйграть- это хорошо. 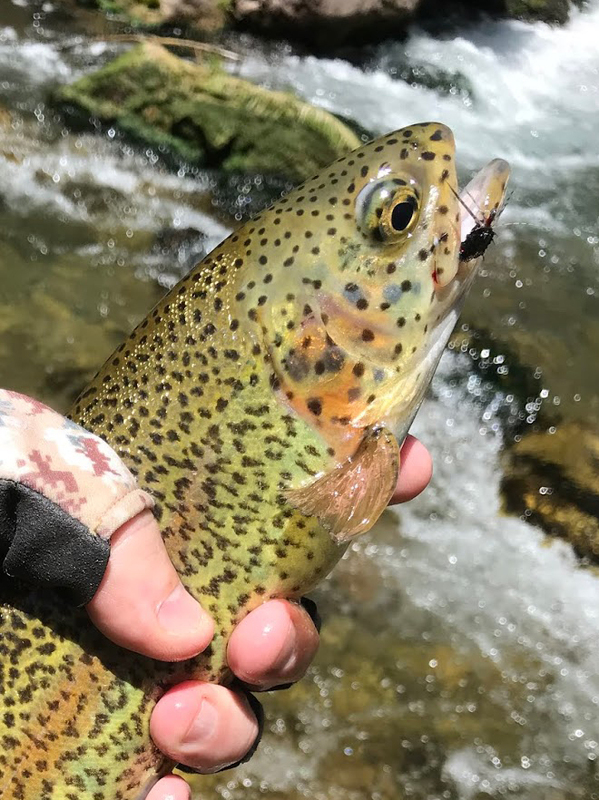 I'm not entering the contest but just wanted to wish everyone good luck and reiterate what others have already said about Teton Tenkara being a great blog. Over the years, I've seen many tenkara blogs come and go. And I'm glad to see Tom has stuck with is and continues to create such great posts. Bought my first tenkara rod after reading your blog. Happy Holidays! Hope I win those beautiful flies. Have only been following you about a year (when I discovered Tenkara) but have gone back and read all of your posts. Your writing has made a huge impact and definitely accelerated the learning curve. Thanks! Appreciate your thorough and honest reviews. Thanks! It would certainly be an honor to fish those flies, especially on your old Oni Type I. I've been enjoying the heck out of that rod. I appreciate all you do for tenkara. Thanks. I'd be more than willing to test whether the flies work in the mountain streams of Scotland! Would be cool to have a traveling fly box that would go from person to person. Top of the list for blogs on this type of fishing. Continue the fantastic work. I follow your blog as soon as a new post comes out. Great stuff. Winning would be nice but seeing the patterns posted great too. Thank you for all your articulate advice and insight Tom! Found your blog through your videos on Youtube. Excited for the chance to win. Thanks for all the great content!